This information was reported on Monday (17 September) by the German daily newspaper “Die Welt”, quoting government circles. The German government did not want to comment on the media reports so far. The Cabinet wants to discuss the matter on Tuesday morning. If Merkel opposes Maaßen, she could provoke a new and significant confrontation with Interior Minister Horst Seehofer and question the continued existence of the coalition as well as the parliamentary group of the ruling CDU/CSU. That could be the lesser evil as it is about confidence in the state security structure. In any case, a new, violent coalition dispute, including the risk of fracture, could not have been prevented in connection with Maaßen. The fronts between the interior minister and the coalition partner SPD were already hardened. While Seehofer appeared at a press conference after the hearing in the Interior Committee of the German Bundestag together with Maaßen and rejected the resignation demands from the opposition, the SPD had decided: Maaßen must go! The dispute was caused by Maaßen’s controversial statements in an interview with “Bild”, in which he suggested that there have been no hunts on migrants in Chemnitz, eastern Germany. Instead, he blamed manipulative media reports that were meant to distract from the previous murder of a German by an Iraqi and a Syrian. Maaßen was not only the backbone of the Chancellor, who had previously talked about hunts. At the same time, he put wind in the sails of AfD, Pegida and other anti-immigrant groups. All this might have been justifiable if Maaßen had been able to substantiate his comments. That is what the inner committee was about: Can he prove his claims? He could not. Instead, he half-heartedly rowed back. For the SPD it was clear that the head of constitutional protection could no longer stay on. In an unusually self-confident manner, the small coalition partner began to demand his resignation. SPD-leader Andrea Nahles left as little doubt as the party’s secretary general, Lars Klingbeil, that the Social Democrats resolutely represent their position and are not ready to give in. With permanent conflicts about migration policy since 2015, it is obvious that Merkel would rather dupe Seehofer than risking to alienate the SPD. In the last few years, the Chancellor has experienced attacks mainly from within her own ranks. Her biggest adversary was all too often proved to be the interior minister. Once, Seehofer spoke in connection with Merkel’s refugee policy of a wrong-wing state, sabotaged her efforts to find a solution at the European level, publicly made no secret that he no longer wants to work with Merkel and constantly heated the debate with new demands and provocative statements on refugees. By contrast, the SPD has been openly committed to the Chancellor’s refugee policy since 2015 and acts loyally. The political dividing lines in Germany these days are not between conservatives and social democrats. The question of migration dominates the entire discourse and the boundaries run between welcome culture and isolation. This dividing line runs also across the Union (of CDU and CSU). 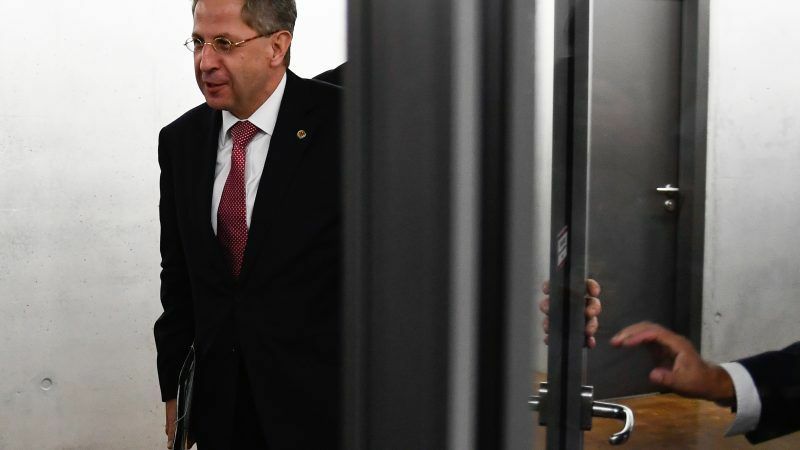 But with the Maaßen matter, it is about much more than only the fate of the head of constitutional protection, the interior minister or even the Chancellor. It is about confidence in the security structure of the Federal Republic of Germany. That Maaßen apparently no longer enjoys the trust of the entire government should already have caused him to resign. That would probably have been more elegant than what is happening now. But more alarming than the critical attitude of the SPD is the sinking confidence of the citizens in the Office for the Protection of the Constitution. Only 38% of respondents in the latest ZDF Politbarometer stated that they had “great confidence” in Maaßens authority – for German conditions, a very low value. At the same time, police got 81% of the vote while 58% of the respondents said they trust in the courts. The bad numbers are not surprising. The authority has gone through too many scandals since Maaßen took office in 2012. The list ranges from the disclosure of confidential data to the US intelligence service NSA to verbal attacks on the US whistle-blower Edward Snowden (Maaßen: “traitors”) and false statements in connection with the monitoring of the terrorist of Berlin, Anis Amri, to allegations of too close proximity to the AfD. Already in earlier years, the authority had largely ruined its reputation in connection with the murders of the “National Socialist Resistance” (NSU). If the Chancellor drops Maaßen now, she might just pull the rip cord in time. The greatest threat to democracy in Europe today is coming from racists. Not only because they know how to use the displeasure of many citizens for their own purposes and record unimaginable electoral successes until a few years ago. But above all, because they manage to eat into the structures of the state. A state in which officials illegally publish arrest warrants and names, and in which the Office for the Protection of the Constitution is suspected of condoning extremist right-wing structures and of “consulting” right-wing parties so they can avoid surveillance, does not give the impression of being able to successfully defend itself against such developments.